While there have been many Sherlock Homes adaptations over the years, Sherlock has been one of the best in recent memory. Created and helmed by Doctor Who alums Steven Moffat and Mark Gatiss (both big Holmes aficionados), they set their adaptation apart by setting it in the modern day as opposed to Victorian times. This permitted them to utilise modern technology and more advanced ways of committing crime while tackling subjects much too risqué for the 19th Century. 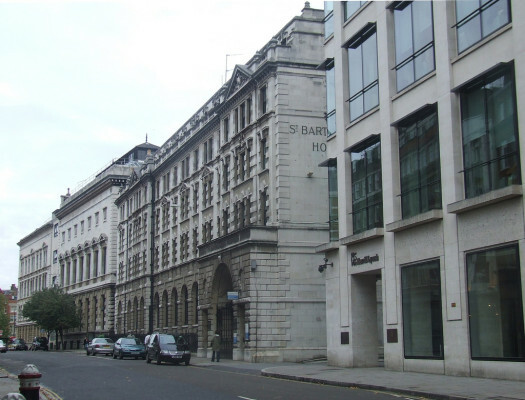 As with Doyle’s original stories, much of the action in the television programme takes place in London, meaning that there are plenty of exterior filming locations to visit. Officially known as the Royal Hospital of St. Bartholomew, this particular location serves an important role across several episodes. It provides the setting for the first meeting between Sherlock Holmes and Dr. John Watson in “A Study in Pink” as well as being the workplace of Molly Hooper and a place for Sherlock to test his theories. Historically, St. Bart’s is the oldest hospital in the UK that still serves the public and was the site of Sir William Wallace’s execution for rebellion against the Crown. While the exteriors are certainly available to view and there is a museum that is open to visitors, it should be noted that access to the roof (where the confrontation between Moriarty and Sherlock took place in “The Reichenbach Fall”) is not open to the public and the interior shots were all filmed in Wales. Another important location from “A Study in Pink”, Tapas Brindisa is where Holmes and Watson go to have dinner, but more importantly, where Sherlock stakes out a black cab, hoping to learn who their mysterious killer is. Having spotted the man he believes to be the murderer, Sherlock and Watson then give chase through the streets of Soho in a desperate attempt to catch him. 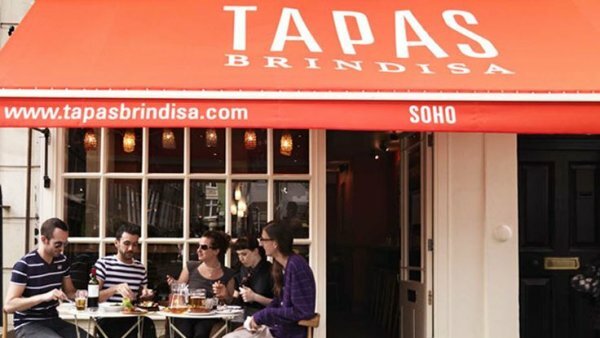 Originally a restaurant known as Tierra Brindisa, it went through extensive renovations in 2011 to become Tapas Brindisa. The interior and exterior changed significantly as a result and looks much different from its television appearance, but the hanging lights above the duo’s table are still there. 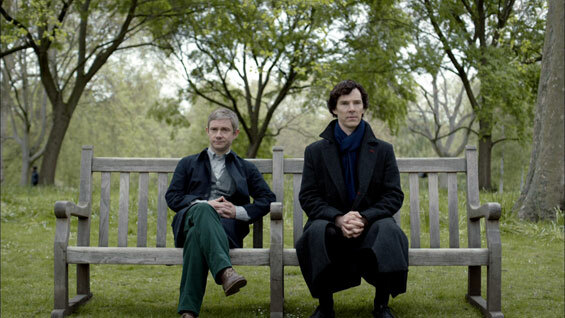 Sherlock and Watson cross over the Blue Bridge over the park’s lake on their way to a case at the Wellington Barracks and stop at a bench across from the Guard’s Museum in “The Sign of Three”. St. James’s is the oldest of the Royal Parks in London and it’s one of the largest open green spaces in the city at 57 acres. Its central location provides a lot of grew views of everything from the London Eye to Buckingham Palace. A word of warning, if you go looking for Holmes’ and Watson’s bench, you won’t find it, as it was placed there specifically for filming and has since been removed. 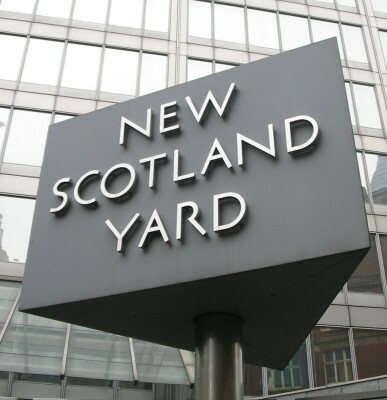 While the name Scotland Yard comes from the Metropolitan Police’s days occupying a building in Whitehall that backed up to Great Scotland Yard, the Met kept the name for its headquarters as they moved locations. Within the world of Sherlock, as in real life, it is the home base for the police and, in fiction, the main office for Detective Inspector Lestrade, Sergeant Sally Donovan, and forensic scientist Philip Anderson. Though you won’t be able to get a “behind the scenes” tour of police HQ without some inside connections, the Met does have a crime museum at New Scotland Yard that is open to visitors. The police also have sold the building and plan to move to a new headquarters, but for the moment, you can still find them (and the famous revolving sign) on Broadway. This is the motherland, the place that is a must-visit for Sherlock fans. While the real 221 Baker Street is home to the Sherlock Holmes Museum, its fictional counterpart is actually 187 North Gower Street. It was “Mrs. Hudson’s Snax” for the Pilot, but eventually, the production crew just decided to let it remain Speedy’s for the remainder of the programme. The show even painted the interior for Series Two’s “A Scandal in Belgravia”, and the café has retained the colour to this day. You won’t be able to go inside No. 187, which is made up of private flats on the upper levels, but Speedy’s is certainly welcoming to the public and doesn’t mind you snapping your fan photos outside. My only flight out of USA, to London, ‘internet friend’ gave us tour of London and we happened into/across set of Shelock season 2 being filmed. I’ve been to the Gower Street location. I actually went to see Jeremy Bentham’s auto-icon at University College. Conveniently, Speedy’s is right down the street. Unfortunately, they were closing for the day so I couldn’t order any food, but they did sell me a bottle of water, which I needed desperately. Walking around London is thirsty work. 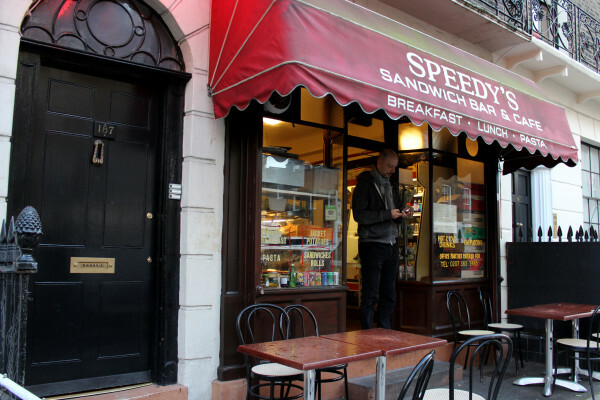 Speedy’s has just made it onto the list of places to visit in London. It would be rude not to! Does anyone know where they filmed Sherlock and Watson in The Great Game coming out of the house in Hampstead and walking along a very pretty street? A green separates the two streets, with a black wrought iron arch on either side near the end. It is so peaceful.